Our family had a great time with Frane! He taught us much about the history and culture of Hvar.... in the first few minutes!! We would all recommend Frane as your guide to Hvar, and we are sure you will be as grateful as we were, to have him show you the beautiful island of Hvar. We have a wonderful trip in Kotor, excellent guide Frane, beautiful Krka National Park and the exciting old city Roman Palace. Thank you very much Frane, you are wonderful and the best. Frane did a great job on our tour. He was waiting for us as we got off the boat. From there he was perfect guide. He was knowledgeable about the various sites he showed us. His open personality made it very enjoyable to spend time with him. He also provided an excellent lunch choice which we thoroughly enjoyed. I highly recommend Frane if your travels take you to Split. Frane was terrific . Very enjoyable tour. His enthusiasm for his beautiful country comes across from start to finish. Very flexible schedule. Highly recommended. Frane was a great tour guide. He was accommodating (for a group of 8), interesting, and very knowledgeable. Enjoyed our tour very much. Excellent day trip to Plitvice Lakes. Frane was a wonderful guide, punctual, considerate, amusing, patient. We really enjoyed our time with him. He also took us to a wonderful country restaurant for a late afternoon lunch with delicious food (albeit a bit too much food). I would highly recommend Frane. Frane was all that could ever be wanted in a guide. He was timely, knowledgeable, personable, approachable, and genuinely interested in giving us the best possible experience. He shared his knowledge of Croatia with us on subjects ranging from culture to geography to politics. He went above and beyond our hopes and expectations, and truly treated us as friends. A great tour with an outstanding guide. TOUR GUIDE RESPONSE: ❤️❤️❤️hope you’ll be back again :-) and to explore more of Croatia... Big hugs to all! A wonderful day with Frane! He drove us to the top of the Krka Waterfalls so that it was much easier for us to enjoy the beautiful forest/waterfalls by walking down rather than up. After he guided us through the forest/waterfalls, he arranged a boat cruise to meet him at the restaurant where we tried a fabulous new dish for us—octopus in black in with polenta! Great day! Frane picked four of us up at the cruise terminal right on time. We were off to Krka park for a tour and swim - really great place. Then off on a boat to a small town down the river and private taxi to Frane's favorite lunch spot. And finally back to Sibenik for a short introduction. Frane was a great tour guide and extended our trip beyond the four hours which gave us time to enjoy lunch and the sights. Only one suggestion, the swimming at the lunch stop would have been better than Krka. Frane was a great host, accommodating a start time change the night before without any hesitation. His knowledge of Croatian history is comprehensive as he demonstrated on our visits to Trogir and Diocletian's Palace. He recommended a very nice local restaurant for lunch, and when he learned they did not have any of the interesting Croatian beers that he had been recommending, he went out and bought them for us while we had lunch: we will be tasting them tonight! He is also a big football (soccer) guy! Frane was an excellent guide. The entire trip was relaxed, fun and informative. From start to finish it was a perfect day and with an awesome guide. We did the Mostar tour from Split and it was great. There is nothing Frane wasn't happy to help with, from a history lesson to simply taking a photo - Frane was always happy and laid back. I highly recommend a tour with Frane, it is well worth the cost to avoid a large group tour. The laid back feel of the private tour was worth every penny. Absolutely great! TOUR GUIDE RESPONSE: Thank you Steve, I had a great fun in Mostar too... I’m always exited when it comes for food in Bosnia... hope to see you again one day in Croatia or in San Diego :-) Have fun in Rome - Roma Caput Mundi! Frane was absolutely brilliant. I was travelling with my elderly parents with reduced mobility and he planned the day accordingly. His knowledge is fantastic and he presents it in a very interesting way. We enjoyed the places we visited and the passion with which Frane "guided" us. He was extremely respectful of my parents which was great. My only slight negative is that the car is not the most comfortable for 4 people. Overall, I would love to tour with Frane again and highly recommend him. An exceptional day. Frane ensured that our day was absolutely seamless, from fetching us at our apartment, advice on the day, and then taking us to the lakes. The insight he provided at the lakes was invaluable - which routes to take - ensured we had the best experience. Additionally the snippets of information he provided really gave us such insight into the country and the culture. He followed it up with a hidden gem of a lunch venue - probably our best meal in Croatia. Could not recommend him more. Frane is an awesome guide. He has a passion for his country and is very knowledgeable about it's history. He has a great sense of humour and made the day very enjoyable. We really appreciate that he organized the tour in such a way so as to avoid the crowds. 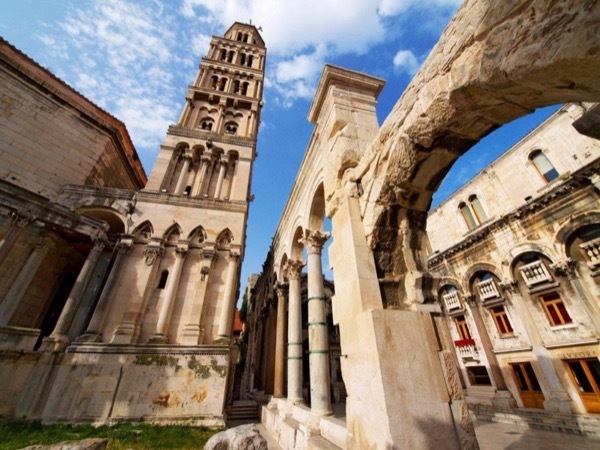 We booked the Split, Salona & Trogir tour with Frane. His intimate knowledge of the people, history, and culture of the area and his enthusiasm in sharing this with us made for a very rewarding and memorable day. I would highly recommend him for this and any other tour he offers! Awesome guide, gets the history and the current culture. We had a great day with Frane. He was a history major and so is a fountain of knowledge on Croatian history and has a nice way of connecting that history to the places we visited so it all made sense. The tour visited the coliseum, Trogir, and the highlight, Diocletian's Palace. We saw a lot in one day and felt that we left with an understanding of the history of what we saw. He dropped us off in time to walk around the old town of Split. Frane was a excellent driver and guide and we recommend him. Frane was wonderful! A real wealth of knowledge He gave us a perfect day in Zadar, Trogir, and Split. Traveling with Frane was an eye opening experience for us. Frane knows his country from every aspect and answered my many questions with anecdotal stories that were entertaining and informative and even my kids enjoyed. Frane showed us the most amazing sites and arranged a lunch at a location that you needed a boat to get there. Frane is tireless and loves to share his country. If you see Croatia with Frane you will see it in an amazing light. The four of us who went with Frane couldn't be happier. Frane provided us the most remarkable day of our vacation. From the time we met him at the port, he was kind, informative, funny, and was always about making our day outstanding. From the falls to the farm, every new moment was a revelation, an appreciation, and now a warm reflection. I would encourage anyone seeking off the beaten path to go with Frane and give yourself a memory of a lifetime. Frane. please give our warm regards to the farm people. In his limited time with us, Frane did a great job of giving us an excellent overview of his homeland. He geared the tour to what we wanted to see and do. We caught him on a very busy day, but we felt we got a great experience. Boyan was an excellent guide. He gave us information about all the sights we saw and then allowed free time to take photos or just enjoy the scenery. He was accomodating to our suggestions and was a wonderful guide that we would highly recommend. Frane was a great guide. He clearly loves his country and he took us to places that we would not find on our own. We highly recommend him. We were absolutely thrilled with our day with Frane. He is a lovely person, very knowledgeable and tailored our tour perfectly. He listened to our interests and made sure we had a great time. He attended to our every need. He is as good a guide as you can find. Our day at the waterfalls and in Split was diverse and fascinating. He knew we were interested in the old synagogue and called ahead to make sure they would stay open for us. Very thoughtful of him. Highly recommended. Frane proposed us a very interesting tour; we appreciated very much his comments and for caring about our confort during the day. We can warmly recommend Frane for a private tour. Thank you Frane ! frane was knowledgeable and very entertaining; I would certainly book this guide again if I was in split again. The trip to the little island was well worth the drive. We went to a locals only restaurant for lunch and I ate like a Croat. Absolutely fabulous service. Frane took the time to send me a descriptive WhatsApp message for our meeting place in Split the day before. He didn't just tell me where, but added pictures of the place he said to meet. He arrived perfectly on time. The tour was magnificent and Frane made the whole experience exceptional. He even drove out of his way to give us a fabulous panoramic sunset view of Split on the way back. I could not give him a higher recommendation. 10 out of 10!!! I have probably never had a guide with so much skill. Frane knows so much and if he doesn't know the answer he is very honest about that. He is not your typical tour guide, who has memorized some information about people and places, but rather has an unsurpassed passion for his country, so that his knowledge is rich, personal and extensive. His love for this place radiates from him, from his eyes, from his smile, from his body language. The fact that he is very handsome just adds to the experience! Frane is the best tour guide you could expect to hire. His English skills are excellent, his knowledge of history, culture, geography, anthropology, and sociology is amazing. He brings everything to life as you travel through the countryside. Not only is his knowledge enormous, but he is willing and able to share this knowledge in a way that makes it very personal and appropriate to your interests. He also has a great sense of humor and a positive attitude toward life. Great guy, great guide. Frane is the most wonderful tour guide and driver you could ever expect to have. From the first moments of our time together, he impressed me with his knowledge, driving skill, and passion for his country. He is eager and willing to personalize your travel itinerary so that every aspect of your trip. He is a really great guy, with lots of experience. If you choose him as your guide you will be thrilled! We did a full day tour with Frane of Trogir and Split, Croatia. He was knowledgeable and interesting to talk to, particularly about politics and history in Eastern Europe. We enjoyed his our time with him and recommend him highly. Rating 5 stars. If you miss Frane's traditional lunch you are just going to have to come back again to do it.... i know i am going to! Frane was very knowledgable, and very accommodating when we asked to take a break for lunch. My 78-year-old mother and I had the immense pleasure of touring the island of Hvar with Frane. We chose to see the island by car, as my mother has difficulty walking and would have had difficulty keeping up with the excursions offered by our cruise ship. Over and over we have said what a blessing it was to have had our own private tour! We saw SO much more and had such an awesome guide! I wish I could post photos, as they turned out amazing! And I can't say enough how much we enjoyed Frane's company! This was our first of two private tours with Frane. Little could we have imagined what a great time we would have with him, riding through Croatia in his "green" Suzuki! Frane was incredibly knowledgable about the sights, was incredibly patient with two "old" ladies (one who needed a walker and one who stopped every two seconds to take photos), and was incredibly personable--a real joy to spend the day with. He never seemed to be in a hurry and made us feel like the luckiest girls on our cruise. Our day with Frane was excellent! He customized the tour for us. He was well prepared and very knowledgeable. In addition to a great tour of Split, he showed us many aspects of the culture, and gave us an opportunity to interact with locals. We enjoyed this day much more than the usual group tours and plan to do more "tours by locals" in the future, hoping for as good a guide as Frane! All I can say is wow! What a wonderful day!! We started by hiking through the beautiful KRKA national park. Afterwards, we took a scenic boat ride and ended our day with an authentic traditional Croatian dinner. France is knowledgeable and fun. I highly recommend this excursion. This tour was the highlight of our 11 day cruise. We spent the entire day on the Adriatic boating, swimming and eating a delicious breakfast and lunch. Frane and our Captains were amazing. I highly recommend this day. Frane was extraordinary. He is knowledgeable, charming, sophisticated, very friendly, accommodating and articulate with the English language. He paces the tour well, is a Safe driver and knows every inch of Hvar. We would recommend him highly and anyone who takes his tour is in for one of the best tours they will ever have. Frane was an amazing guide! Our first time to Split and we were able to discover the beauty of Trogir AND everything about Split. Friendly, personable, knowledgeable, I could keep going and going.... If you're traveling to Split, do this tour, you won't regret one second of it. Frane was a wonderful tour guide and worked with me to do the itinerary that best suited my family. Going to see the falls was so much fun. But even better than that, he gives you time to swim and relax and enjoy the beautiful falls and your surroundings!! Thank you, Frane, for a wonderful day in Croatia!! Frane was wonderful ! he explained with details all culture history and customs! our group loved him! thanks! Frane was great showing us much of the Old Palace and Krka falls. We learned a lot from the tour and would recommend him to friends. I would highly recommend our tour guide, Frane. He is very knowledgeable of the history of Split, particularly, the Diocletian Palace. He picked us on time and drove us to Marjan Hill where we saw the panoramic view of the city and Riva. Frane is also very friendly and easy to get along with. Frane was fabulous. What a knowledgeable, personable man! He treated us like visiting family. Frane was flexible and took us where we wanted to go. He went above and beyond to help us see Krka and the Visovac monastery. We highly recommend him for any tour. His English is exceptional, and he is a font of information and help. I wish I could add an exponent to the five stars. *****!!!!! My wife and I along with my brother and his wife toured with Frane in October 2015. We did the Krka Waterfall and Wine Tasting tour and loved it. The falls were beautiful and the private wine tasting is something you don't want to miss. Frane is very knowledgeable and does a great job!!!! We spent an excellent, fast paced, educational day with Frane! We visited Trogir, Klis Fortress, a quarry where Game of Thrones filmed, and Diocletian's Palace. Frane is very knowledgable about his hometown and its history, and shared his knowledge & patiently answered our questions throughout the day. Frane's English is excellent and he knows Game of Thrones very well. We highly recommend Frane!! Frane was excellent: good guide, excellent english, and brilliant car! I have long awaited visiting Split and it certainly did not disappoint even though we had a on again off again rainy day. Trogir was wonderful and worth the trip. Having a professional guide allowed us to truly appreciate all of the gems we might have missed on our own. Thank you Frane! Frane spoke perfect American English and gave us the history and current views on Croatia as well as a brief lesson in Croatian. He adjusted his tour to our interests and adjusted the pace of his tour to accommodate our abilities. He recommended we change our starting time and it was excellent advice. He showed up early for our tour and we did not have to worry if he would show up on time. He is very personable, answered all of our questions and made recommendations for our future travel. Amazing tour. Just me, with time to kill before my next flight. So glad I did--Spent 8 incredible hours seeing Mostar! I recommend without reservation! Frane's knowledge about the history of the region is amazing. He showed us a terrific three hours and we know have a much better understanding of both the recent history and occurrences 3 or 4 millennium ago including traces of the Croatian people back to Iran, etc. He also gave us great restaurant ideas which we will start to experience tonight. We hardily recommend his service to all. Frane provided a truly SUPERB tour experience with a well planned and organized itinerary. We thoroughly enjoyed the experience. THANKS, FRANE! Frane was an outstanding tour guide in Split. Not only did we get a wealth of information and history, but his knowledge and background information regarding Game of Thrones was excellent. He took us to places that we'd never see in a ship excursion. We would highly recommend him for any tour in Split. Our tour guide Frane was excellent all around. He was very knowledgeable about the history of Split along with Croatian culture and the local people's lifestyles in general. Our group of 7 was accommodated very well and though it was a very hot day, Frane arranged to have a nice air conditioned bus take us between tourist sites. A very patient guy Frane was always able to satisfy our needs for shopping and dining. Extra points for being a Game of Thrones fan and showing us local filming locations. frane is a very good guide. He knows a lot about history and he makes a dynamic and very interested tour. Fabulous, out-of-this world, breathtaking, moving, and eye-opening experience going to Mostar with Frane. He is a superb guide and driver; patient, thoughtful, careful, knowledgeable, articulate. We so appreciated the wonderful lunch, the additional visit to the 'great wall' at Ston, and the oysters! We are a 61 year old academic and a 21 year old college student --- Frane was perfect for both of us. We were sad to say goodbye to him and recommend him unconditionally. Frane is a terrific guide. First we went to the highest point in Split for the view and we saw the centuries-old Jewish cemetery. We then spent two hours in Diocletian's Palace. Frane is very knowledgeable about history and architectural styles; he knows the complexities of Diocletian's Palace; he is friendly, dynamic, and articulate. Not only did I (a university professor) learn alot but my 20-year-old son was excited and engaged by the entire tour with Frane. I highly recommend him for all ages. Frame was a great guide. We spent a great afternoon with him. We would definitely recommend him. Frane, Drives very well, very caution and very friendly. I recommend him to evryone. Frane knows everything about the history and culture of Split! He is a phenomenal tour guide with a deep love of his country. Because of this tour we are very much in love with Split and want to go back to spend more time there! It is beautiful and there is so much to enjoy and do! Fran has a real talent for imparting information in an engaging manner! We covered so much, took so many pictures and the conversation never lagged! Had an amazing time and we can't thank him enough for such an amazing tour! TOUR GUIDE RESPONSE: Dear Mrs. Andreia, thank you really much :-) See you soon for the next tour, lookin' forward for that! Best tour ever!!! Super patient with everyone and he even greeted us with local snacks and had water for us after our hike. Amazing! Every tour we've had since then has been such a let down because we were spoiled. He's very knowledgeable about the history and makes sure to take you to good local places to eat and not the most expensive place where hed get a kickback. If I could give him 6 stars I'd give him 10!! Days after our tour we continue to speak of him. You won't regret booking with him I PROMISE! I want to tell you that Frane V, the guide we had in Split (Croatia), was VERY GOOD. Our tour with Frane was excellent. He is enthusiastic and knowledgeable and provided a great balance of historical facts combined with some personal insights into life in Split. I would highly recommend Frane. We were able to easily navigate a complex day and he even organized a last minute boat with lunch. We simply could not have enjoyed the day as much on our own. Are 6 stars possible? Frane amazed us with his wealth of knowledge and kind character. We enjoyed our day with him in Split learning about the reach history of the region. He was amazing!! We found Frane to be extremely knowledgeable. He was a careful driver, on time, and eager to please. It was a pleasure to spend time with him. We enjoyed our tour with Frane so much. He tried very hard to show us all that he knew would interest us in addition to the usual sights, taking us to a beautiful old Jewish cemetery and called ahead so we could visit the synagogue in Split. He was an excellent guide and was able to answer all our questions. He delivered all that was promised and then some. We were very pleased with our tour with Frane and with Toursbylocals for making it so easy to arrange the tour. Only problem was miscommunication with pick up. Fortunately someone Had a European phone and let us call Frane. After that the tour was wonderful! Frane was extraordinarily knowledgeable about Hvar and the history of Croatia and Yugoslavia. We spent the entire day with him and he drove us all around the island showing us not only the main sights but sights only an interested, professional guide would know about and want to share with his clients. I have traveled extensively for 20 years and Frane was as good a guide as I have had anywhere. I highly recommend Frane as a guide. Frane was our first guide and he set the bar very high! On time courteous, knowledgeable, he made our journey so much fun. His knowledge of history is presented in a most interesting manner. He is also a very good listener to the clients stories, tales and jokes. Frane comes with the highest marks. He exceeded my every wish and expectation. Hire him.. You will fund a valuable fun experience in a personalized unique for you fashion and a new friend. Upon first meeting Frane we were treated like friends. He helped us in many ways to be comfortable on our first trip to Croatia. As he guided us through Trogie and Split it was clear he knew these cities well. He brought them alive for us. Our tour with Frane in Plivice Lakes National Park was fun and interesting. During our time with him we always felt he was informative and caring and helpful. He told us about himself so we had a connection to our visit. Thank you!! If we could give a 5+ star we would. He was our favorite guide. He was very knowledgeable, flexible, thoughtful, and we just enjoyed his personality! It was a great tour and we would love to go back sometime. Frame was a wonderful guide. He knows his stuff, is personable, full of humor, friendly and professional. Frane was on time, professional, organized, informative, flexible, and polite!!!! Frane was an excellent guide!! We thoroughly enjoyed our tour of the Omis Town, the Cetina River ride and our lovely lunch at a local restaurant on the river. We even had time for a little shopping in the Old Town before returning to our cruise ship. He was very informative, friendly and professional. We had very limited time in Split and Frane really maximized our visit. Do not hesitate to book with Frane!! He is a great guide. He is knowledgable, friendly and professional. Thank you Frane!! TOUR GUIDE RESPONSE: Dear Nancy, thank you really much for awesome feedback :-) It was not "job" for me to have you here, it was more an enjoyment and a meeting with best friends after long time :-) Hope to meet again, you two beautiful girls :-) All the best! Frane is a super knowledgeable and personable guide. Worth every penny! Very good guide. Very friendly and on time. Would highly recommend.